A Tyrone mother, whose daughter had a non-malignant brain tumour aged just three, has praised the work of ‘Brain Injury Matters’. Jill Boyd also commended the charity’s dedicated rehabilitation programmes which helped her to deal with issues that have affected her life and the lives of her family since her daughter Olivia’s brain tumour. She was speaking out as Brain Injury Matters, a brain injury rehabilitation charity in Northern Ireland, successfully secured two papers to be presented at the International Conference on Paediatric Acquired Brain Injury at Queen’s University Belfast at the end of September. Jill said: “The impact of an acquired brain injury, especially when it is your child, is life changing for the entire family circle. 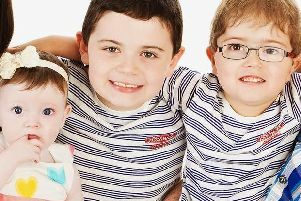 Olivia was only three-years-old when a brain tumour was discovered following a routine eye test. Family First practitoners work alongside the family to provide the appropriate support to their child with an acquired brain injury. They work in partnership with parents, children and siblings.